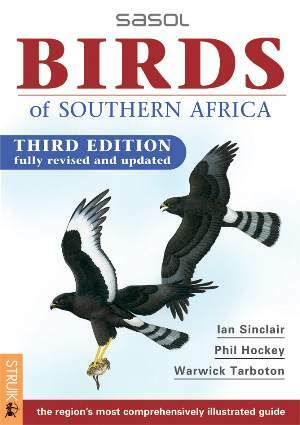 The Sasol Birds of Southern Africa by Ian Sinclair, Phil Hockey and Warwick Tarboton, is described on its cover as "the region's most comprehensively illustrated guide" and it is hard to disagree with that. It is a well-bound book, protected from the damp and wet by having a laminated cover and is the ideal field guide for Namibia, Botswana, Zimbabwe, Mozambique, Lesotho and South Africa. It has been through several editions and is published by Struik, Cape Town, SA.